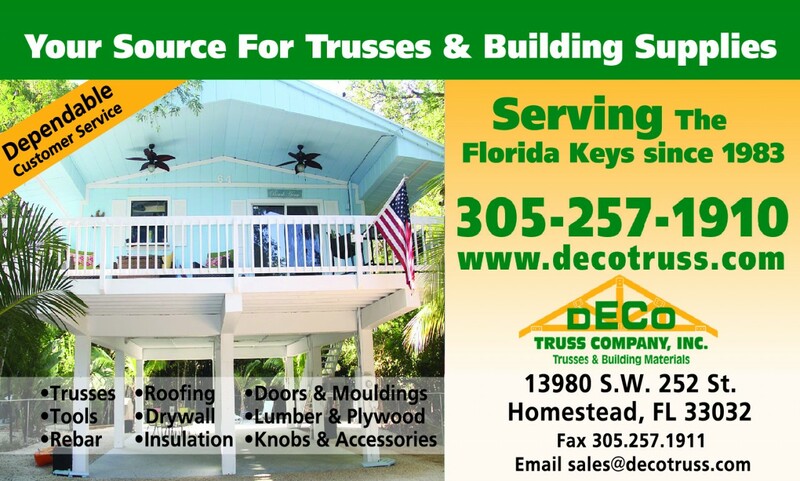 Since 1983, Contractors, Architects, and Do-it-yourselfers just like you have trusted and put their loyalty in Deco Truss® as your #1 Truss and Material Supplier. Currently supplying materials throughout South Florida, the Florida Keys/Key West, Florida’s West Coast and The Caribbean. DecoTruss®’ dedication to Employee’s, Customers and Suppliers ensures that you receive the finest quality and services at the best possible price. Deco Truss® continues to offer you a complete range of supplies, from exotic hardwoods and decking to concrete and rebar to doors and mouldings. We take pride that our family-owned business offers the best in personalized service and also competes with national companies in the quality of our products, our prices, and the extent of our capabilities. We treat you and your project as if it was our own and all products and workmanship are fully guaranteed.